You may have noticed that one of the slides in my last post was a little funny looking. We have many teachers at our school in Kuwait who are native Arabic speakers and are at varying levels of English proficiency. We did quite a bit of searching and asking around but we weren’t able to find any resources to introduce SAMR to our Arabic staff. One of our wonderful HS Arabic as a Foreign Language teachers was amazing enough to sit down with me and work on a translation of SAMR. 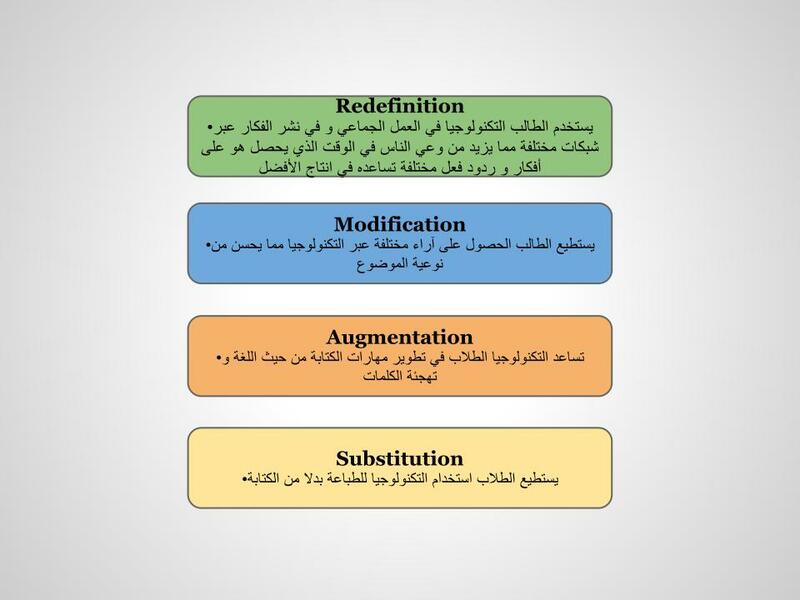 This translation keeps the English words for Substitution, Augmentation, Modification and Redefinition (to keep the acronym consistent). In addition, it is not a direct translation but gives an idea of the meaning behind S, A, M & R.